In case you didn't know, the Free Library has an ever-expanding collection of interactive online exhibitions featured on our website, with topics ranging from science fiction and brewing beer to global culture and Medieval music manuscripts. 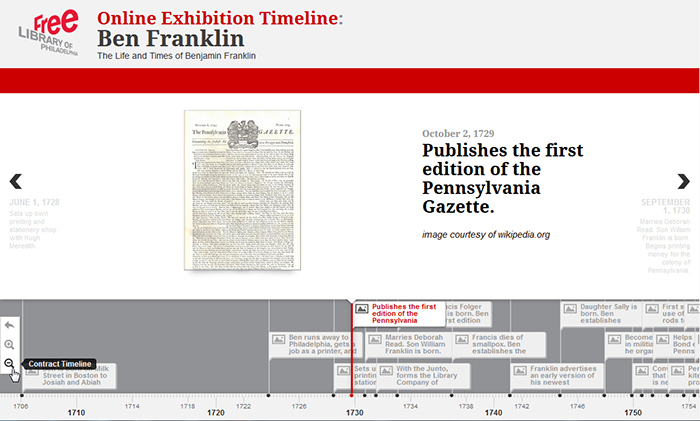 Once we got the timeline function up and running, then we just needed to pick a subject that was voluminous enough to fill up a cool interactive timeline. Maybe highlight a phamous Philadelphian and historical figure's life and times? Oh, I know! 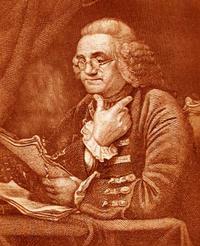 Benjamin Franklin! It just so happens to be Ben's bday today--his 308th to be exact--so let's celebrate the inventor, author, printer, postmaster, scientist, musician, satirist, civic activist, statesman, politician, and diplomat, while we walk you through some of the features of the timeline. 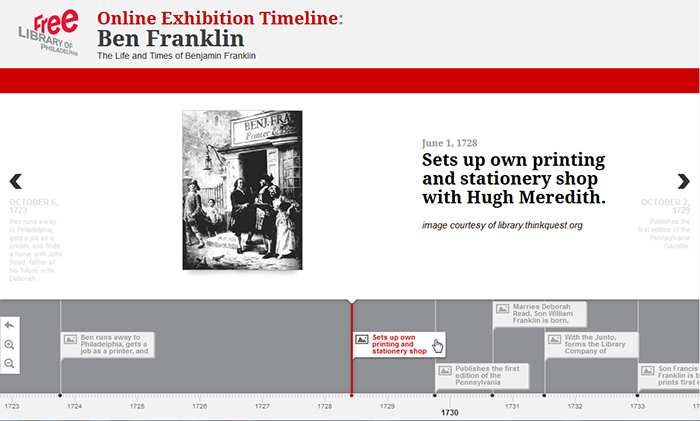 This is the basic look and framework of an online exhibition timeline: there is a viewing area where you can see the subject of the timeline in bold with a description of the subject underneath, as well as a related image. 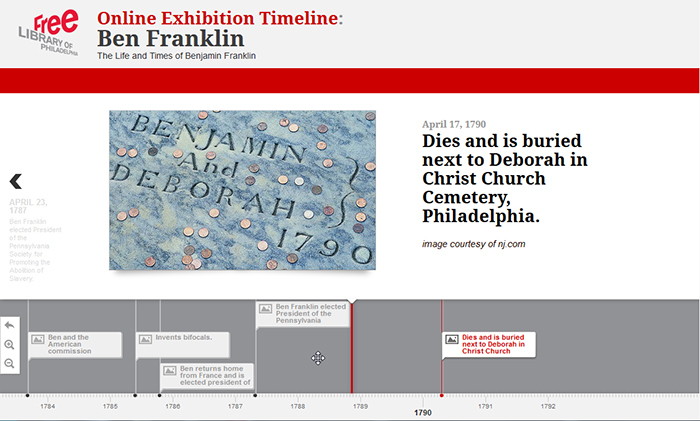 The timeline itself, with dates and flag markers indicating clickable content, is below the viewing area. 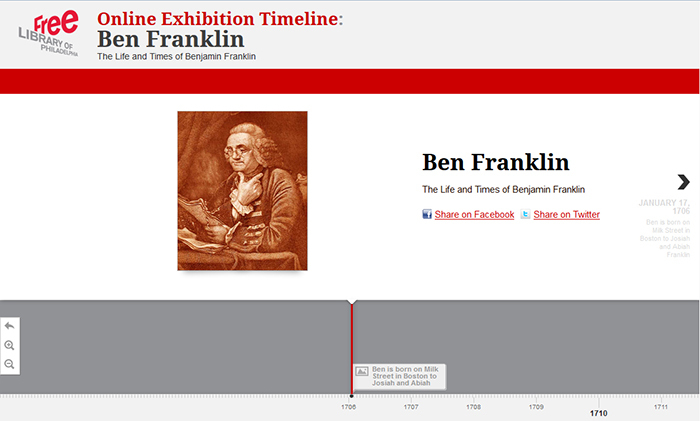 There are also links to share the timeline via your favorite social media sites. When you click on any flag marker in the timeline, it will be highlighted red and you'll be taken to that specific date on the timeline. Information including text, images, videos, and / or audio about that date will display in the viewing area. 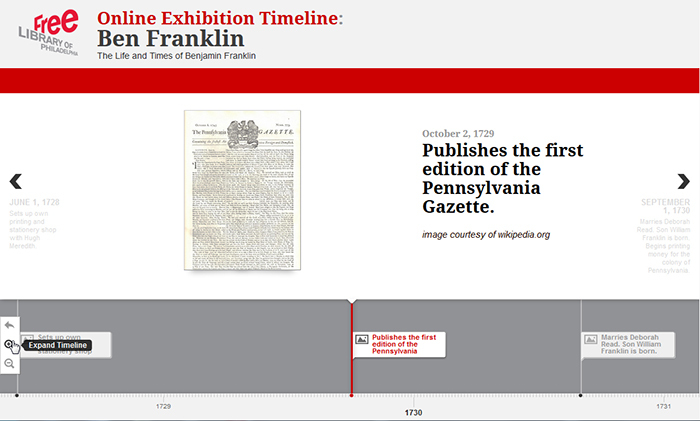 You can Expand or Contract the amount of visible dates on the entire timeline from the left-hand side menu illustrated in the two screen caps above. You can navigate forward and backwards through the timeline by using the arrows on the right and left of each displayed date in the viewing area, or you can place your cursor in the timeline itself and click and drag the entire timeline forward or backwards. 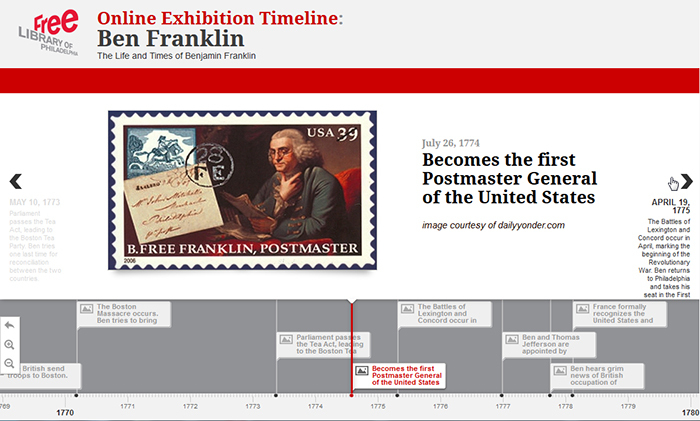 To return to the beginning of the timeline at any time, just click on the Return arrow on the left-hand side menu illustrated above. 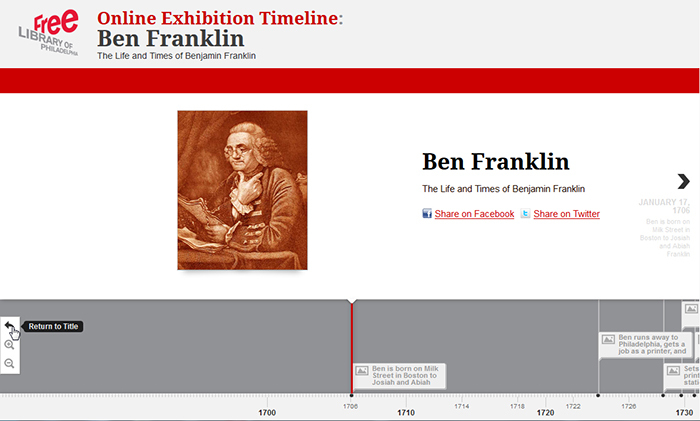 So take a minute and check out this timeline and some of the other great online exhibitions currently on our website! Let us know what you think of our new timeline feature in the comments section too!